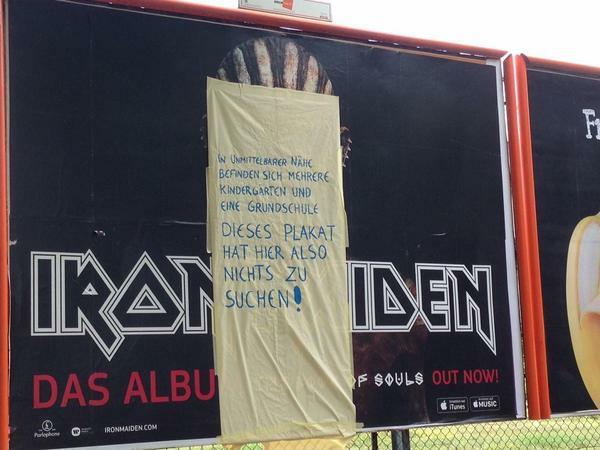 A billboard promoting Iron Maiden’s newly-released album, “The Book Of Souls”, has been covered up by a group of angry parents in the Kreuzberg district of Berlin, Germany. Stern.de reports the cover artwork from the band’s first-ever double album – designed by Mark Wilkinson and featuring the group’s mascot Eddie – has been censored by concerned parents who say the image has no business being advertised close to schools in the area. The group hung a handwritten sign over the billboard with the message (roughly translated): "In the immediate vicinity are several kindergartens and a primary school. This poster here has nothing to FIND!" Iron Maiden’s 16th album, “The Book Of Souls” was produced by Kevin Shirley and recorded in Paris in 2014. Released last Friday, the project is already on track to top the album charts in the group’s native UK, where it has a 30,000 sales lead ahead of nearest rival Jess Glynne and appears set to deliver the band their fifth Official Albums Chart No. 1 this Friday. Iron Maiden will launch The Book Of Souls World Tour in the US next February.